Proprietary Name: Colcol-s What is the Proprietary Name? Non-Proprietary Name: Acetaminophen, Chlorpheniramine Maleate, Pseudoephedrine Hydrochloride, Dextromethorphan Hydrobromide Hydrate, Guaifenesin What is the Non-Proprietary Name? 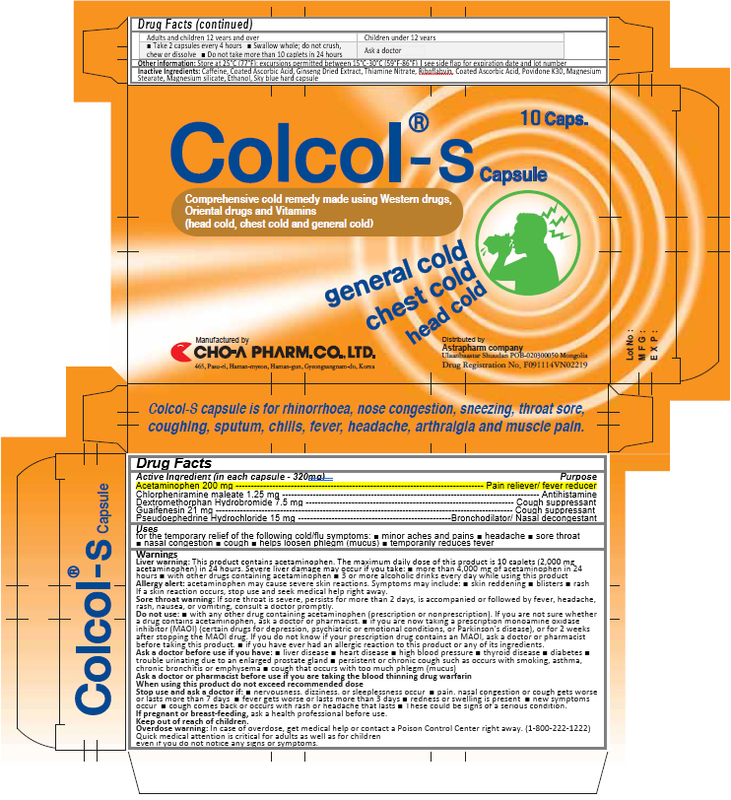 Colcol-s with NDC 58354-111 is a a human over the counter drug product labeled by Cho-a Pharm.co.,ltd.. The generic name of Colcol-s is acetaminophen, chlorpheniramine maleate, pseudoephedrine hydrochloride, dextromethorphan hydrobromide hydrate, guaifenesin. The product's dosage form is capsule and is administered via oral form. Sore throat warningIf sore throat is severe, persists for more than 2 days, is accompanied or followed by fever, headache, rash, nausea, or vomiting, consult a doctor promptly.Do not usewith any other drug containing acetaminophen (prescription or nonprescription). If you are not sure whether a drug contains acetaminophen, ask a doctor or pharmacist. Ask a doctor before use if you haveliver diseaseheart diseasehigh blood pressurethyroid diseasediabetestrouble urinating due to an enlarged prostate glandpersistent or chronic cough such as occurs with smoking, asthma, chronic bronchitis or emphysemacough that occurs with too much phlegm (mucus)Ask a doctor or pharmacist before use if you are taking the blood thinning drug warfarinWhen using this product do not exceed recommended doseStop use and ask a doctor ifnervousness, dizziness, or sleeplessness occurpain, nasal congestion or cough gets worse or lasts more than 7 daysfever gets worse or lasts more than 3 daysredness or swelling is presentnew symptoms occurcough comes back or occurs with rash or headache that lastsThese could be signs of a serious condition.If pregnant or breast-feeding, ask a health professional before use.Keep out of reach of children.Overdose warningIn case of overdose, get medical help or contact a Poison Control Center right away. (1-800-222-1222) Quick medical attention is critical for adults as well as for children even if you do not notice any signs or symptoms.